A 9-foot crocodile sunbathing in the mud beside them jumped over the top of their canoe and landed in the water in front of them. 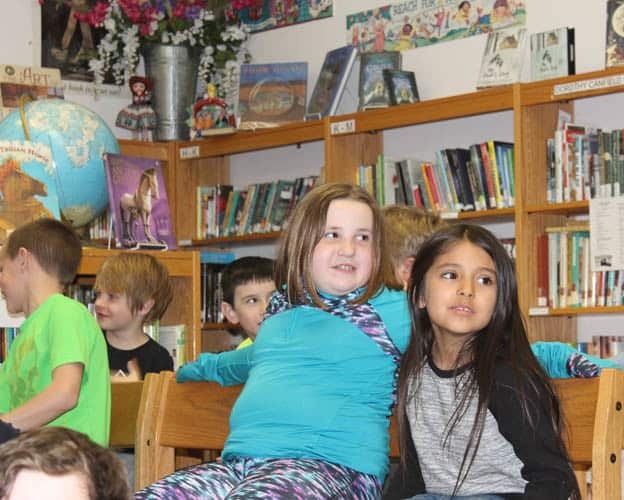 “Like a great, big belly flop,” Arnosky told a room full of students at the Killington Elementary School Monday afternoon as they laughed. Arnosky wrote and illustrated the acclaimed book, “Crocodile Safari” after that. That’s how Arnosky writes all his books. Arnosky, 71, has written 140 books related to nature. He lives on a farm in South Ryegate and has received numerous awards, including the Christopher Medal, Orbis Pictus Honor, ALA Gordon Award, and Outstanding Science book awards from the National Science Teachers Associations. Arnosky read to students, played songs on his guitar and drew wildlife at Killington Elementary School Monday afternoon. Arnosky’s presentation was funded partly by a $2,500 Children’s Literacy Foundation (CLiF) grant the Roger Clark Memorial Library in Pittsfield received last year. Part of the grant money went to purchase new books for the Pittsfield library and Killington Elementary School Library. Each student in the school also received two free books on Monday. CLiF, based in Waterbury Center, gives away about $700,000 a year for new children’s books throughout Vermont and New Hampshire. CLiF gives books to schools, shelters, low income housing developments, prisons, refugee programs, foster programs and families battling opioid issues. CLiF just celebrated its 20th anniversary. CLiF Executive Director Duncan McDougall said he’s a favorite at school presentations. “He’s been giving presentations for decades” McDougall said. Jim Arnsosky reads to students at Killington Elementary School on Monday, April 23.